When the occasion calls for a centerpiece that is magnificent, yet easy to serve, our spiral-sliced hams are the perfect choice. 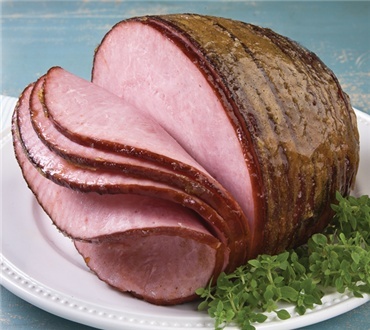 The boneless spiral offers the same great taste as our traditional bone-in spiral ham with no bone and no waste! In each lean and tender bite, you can taste the exquisite maple-glazed and cob-smoked flavor. Each 1/8" slice is joined in the middle to hold the shape of the ham. Fully cooked. Serve room temperature or gently warmed. Featured on the Food Channel as a "Food Find". Estimate 1/4 lb per person buffet style or 1/2 lb per person for dinner, depending on appetites. Easy To Prepare, Flavorful, Non-Perishable, The spiral cut adds ease of serving to the list. As with all Dakin boneless hams, it is good quality all the way through. The spiral cut does not go all the way through, so be prepared to cut through the center to separate the slices. This is not a criticism, only a comment. Great product, the flavor was incredible. This was a favorite at our dinner table. We will purchase this ham again in the future. Thank you. Bought it for Easter dinner It was excellent!!! Our family loved the taste of your delicious ham. We used our ham as the main entree for Easter dinner. The leftovers were used in casseroles, sandwiches and snacking. Delicious ham made for a delicious Easter dinner! Ham was tasty and easy to prepare...shipping was excellent and it arrived in FL when promised!